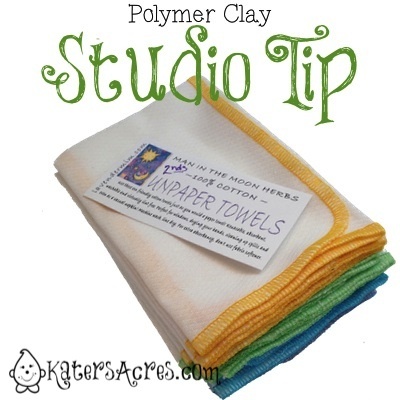 Today’s studio tip is a rare one as it has almost nothing to do with polymer clay … but it does have to do with your studios. Three cheers for helping keep your studio clean! Okay, so we all know that I like a clean work environment. There are many who thrive in chaos, but for me, my studio is cleaner than the rest of my house! (I’m not lying here, this is the truth, come to my house and see for yourself.) This is not an artist feature, but in part I am showing off a wonderful lady named Gail who makes some awesome items that I use every single day in my studio! I am not eco-friendly. Okay, so maybe that’s a stretch, because I certainly do my fair share of conservation techniques, however, I generate a ton of waste in my studio. My most devious of which is the massive quantity of baby wipes that I devour, destroy, and end up tossing at the end of a studio day. I have bought these particular cloths from Gail for several years now. I use them in my kitchen, in our lunch boxes, to dust my house with, and even to wash windows with. I love them. I could not run the upstairs of my house without them…I hate wasting paper towels upstairs, so these have been around for a long time. But everywhere else … not so eco-friendly. While working in the upstairs to clean my house, I somehow had carried one of these beauties down into my studio – “OOPS!” I thought to myself. It turns out that “OOPS” was actually a profound moment for me. When I was done with my usual clay session I thought ‘why not clean up with this little guy?’ So clean up I did. And WOW! My studio has never looked so good. (For those of you who thrive in chaos, these guys might not help your cleaning routine.) Usually when I am done I wipe down all my counters with a baby wipe, repeat with some rubbing alcohol on a paper towel, or on very messy days soap & water with a sponge, then shut off the lights and walk away. However, that all changed. In fact, it changed so fast I had to buy 2 more dozen to house in my studio! First … birds eye cotton does not pill or leave fibers behind! WOW! Who knew? So when cleaning up with paper towels, fuzzies, dust, and debris were always left behind (along with some of those annoying clay bits). Second … I have had my sets upstairs for almost two years now! I think each have been washed over 100 times in those 2 years and they still look new despite all the dirt & dust I cleaned up with them. Reality check … Now that I am using these in my studio with paints, polymer, & other materials, I do not expect that they will look new. I do expect that they will stain. In my day Birds Eye was used for diapers. I have one that is 81 years old and was used on my bottom. I have just begun to explore polymer clay and love all your tips and tricks. Keep up the good work. I had NO idea Eloise! How neat. Thanks for sharing, come back soon!